There are many memory foam mattress product lines to fit your every need and budget. From the top-of-line Gel memory foam mattress to the economical memory foam toppers, each product is made with the highest concerns for health, well-being, hygiene and lifestyle. The majority of Nature's Sleep products are washable, anti-microbal, anti-dust mite, anti-bacterial and allergen resistant and are ideal for those who suffer from allergies. I had a hard time choosing because they all seemed so good! Mattresses come in all sizes and they even have toppers, adjustable frames, foundations, slippers, pillows, and even dog beds. 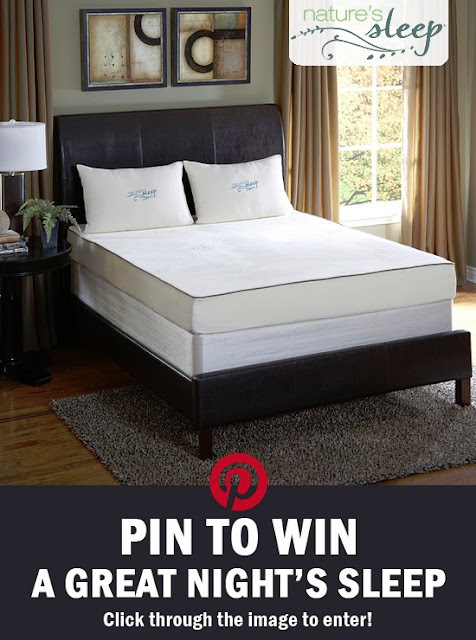 We're giving away a mattress via a Pin-To-Win giveaway. However, right now through this Pin-To-Win a Great Night's Sleep promotion, use code: PIN2WIN for 25% off the entire website excluding adjustable foundations. Don't forget, you also get free shipping with every order. Offer valid in US until Aug 15, 2013. See what Nature's Sleep has to offer you, and shop now. Nature's Sleep invites you to join in the Pin-To-Win a Great Night's Sleep. The prize is a King 8" profile memory foam mattress with a value of $1700. Follow the simple instructions below and submit your entries from Jul 1 to Aug 15, 2013. Open to US. Good luck! Please take the time to enter my other giveaways while you're here. 1) Create a board titled "Get Great Night's Sleep with Nature's Sleep" on your Pinterest account. 4) Enter your entries in the Giveaway Tools form below.